The settings control is used a bit differently from the view and edit controls. On the module settings page the standard settings are always shown. If you create and register a settings control it will be appended to the end of the standard settings and show up at the bottom of the page. While the edit page is used to edit the content of the module, the settings page handles the behavior of the module. In our scenario we will create a settings control where you can configure if the product description will be displayed or not. And yes, I know it’s a pretty lame example but at least it doesn’t clutter up what I am trying to show: the basics for creating a settings control. ‘Nuff said, let’s get to work. Now open Settings.ascx.vb. As you might remember from previous parts the view and edit controls inherit from PortalModuleBase. An important difference with the settings control is that it inherits from ModuleSettingsBase. If you are going to create your controls from scratch, don’t forget this. ModuleSettingsBase inherits from PortalModuleBase and gives us members necessary for loading and updating settings for the module instance. No black magic here either. In LoadSettings we get the settings from the settings store and populate our controls (in our scenario we only have one checkbox). In UpdateSettings we get the settings from the controls and stuff them back into the settings store. Note that settings are only stored in string form, so you have to convert them to and from strings if they are other types (as our show description setting is a bool). ControlTitle_settings.Text: This is the section header text for your settings control. ShowDescriptionLabel.Help: Tooltip text for the question mark icon by the Show description label. ShowDescriptionLabel.Text: Text of the Show description label. ModuleHelp.Text: When the Help link is clicked, this text is displayed. Now compile your project so we can go ahead and register the control. In DotNetNuke, go to Host > Module Definitions. Locate Products in the list and click the edit icon. Scroll down to the Module Controls section and click Add Module Control. 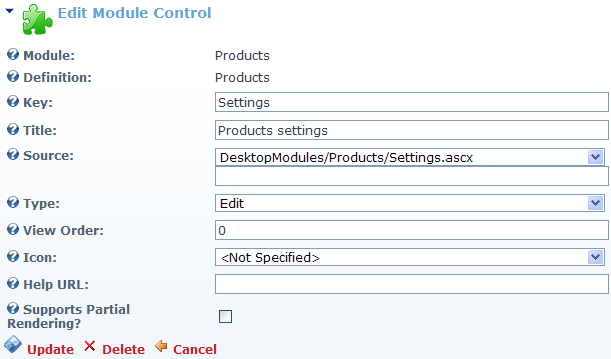 Now go to the page where you added the Products module and click the settings icon. At the bottom of the settings page you should now see your settings control as the section with the header Product Settings. If you play around with the Show description setting you will notice that the product list shows the description regardless of what you set. This, of course, is because we have not yet implemented any functionality in the view control that takes this setting into account.
' Show description according to setting. Compile the project again, the go and play with the setting again. The list should now display the description text only if the Show description checkbox is checked. DotNetNuke 5 module development tutorial - part 6: The settings controlThe settings control will let you configure the behavior of your module. In this part we will create...(VB) DNN 5 module development tutorial - part 4: The view controlWe create the view control, run the database script and add the module to DotNetNuke. (VB) DNN 5 module development tutorial - part 3: The data layerWe examine the data layer and the data objects setup SQL script. Thanks for the tutorial. I was wondering if I needed to use the DNN starter kit for this tutorial or if I could use the DNN Install version? Thanks again. Take a look at part 1 of this tutorial series. There I talk about what you need to get started.